World Music/CRASHarts (WM/CA) is a nonprofit organization that presents diverse artistic experiences that inspire, entertain, challenge and transform. 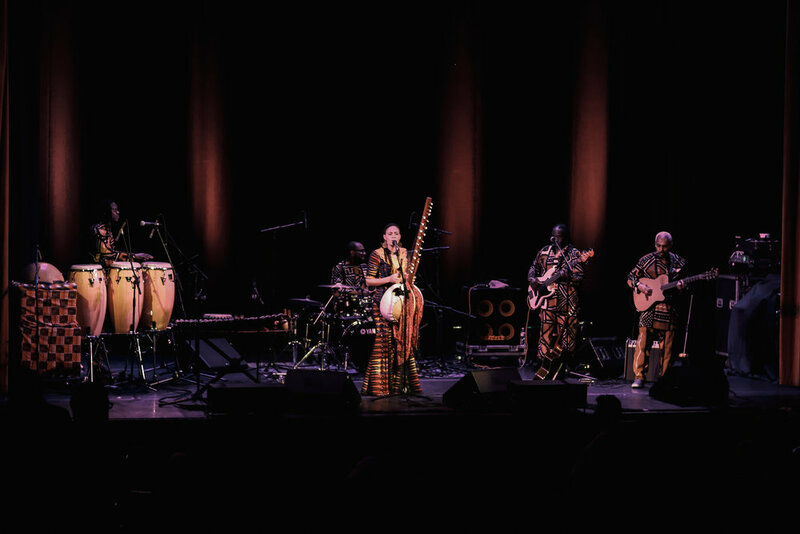 We provide a platform for established, emerging and under-represented global performing artists, fostering a diverse community committed to cultural equity and participation in greater Boston's arts arena. For almost 30 years, WM/CA has used the power of the arts to provide a space for artistic dialogue and engagement. In the current political environment, we believe the need to create a common meeting ground for diverse audiences and artists to learn from each other, encourage cross-cultural collaborations, and share in the excitement of cultural discovery is increasingly important in a divided country and world. WM/CA strives to offer audiences an opportunity to share in many different artistic expressions and seeks to foster an atmosphere of cultural exploration and diversity that reflects today’s global community. We are committed to creating an inclusive and supportive environment at our performances, in our offices, and in the community. We strive for everyone to feel welcome and valued regardless of race, ethnicity, gender, religion, sexual orientation, ability and disability, and age. We understand that achieving equity is a continuous process and one we embrace as essential to our mission. We strive to present the highest quality performing arts and offer unique programming in greater Boston. We seek to build cultural bridges across diverse communities of artists and audiences. We work to create global cultural awareness and understanding on a local level. We facilitate inclusion by making outstanding art accessible—by breadth of venues, pricing of admission, and education programs. We search for the new and unusual, providing a platform for our artists’ creative expression while challenging our audiences’ assumptions. WM/CA impacts the greater Boston community by creating (a) awareness and respect for different cultures through the performing arts, (b) inclusive and accessible cross-cultural experiences that encourage diverse audiences to come together as a cultural community, (c) opportunities for local immigrant communities to celebrate and share their cultural identities and heritage; and d) a platform for artists of different cultures to expand and share their newest work through presenting premieres, newly commissioned work, and innovative collaborations. You can learn more about the work WM/CA is doing by visiting their website. You can also join us as we partner for the Arts Equity Summit by checking out our kick-off event on Friday, March 22nd! UNLESS by Stephanie Cardon was produced by Now + There and installed in the Prudential Center during Fall 2018. This massive floor-to-ceiling installation, which was created in collaboration with residents of Inquilinos Boricuas en Acción's Villa Victoria community and Puerto Rican MassArt students displaced by Hurricane Maria, sheds light on to the inequities of climate change and issues a call to action for all who pass through. Artist Silvia Lopez Chavez's colorful "Patterned Behavior" mural on the Esplanade was produced as a part of Now + There's "Year of the Woman" programming in 2017. Artist Ekua Holmes was one of seven participants in N+T's first Public Art Accelerator. 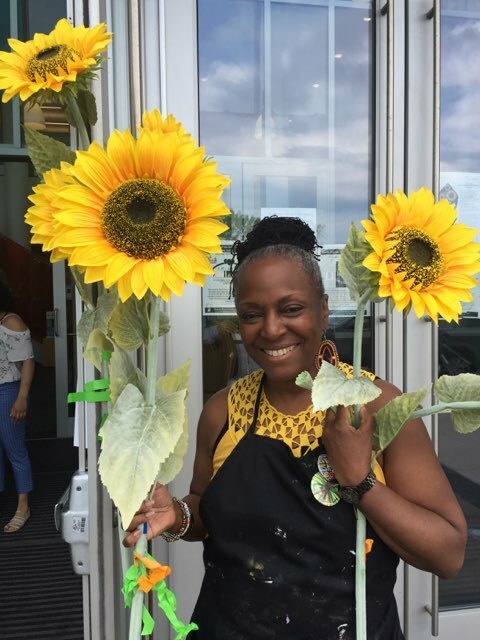 Her "Roxbury Sunflower Project" brought nature, beauty, and color to the Roxbury neighborhood by inviting families, organizations, and agencies to plant 20,000 sunflowers in Roxbury during the summer of 2018. Arts equity means prioritizing an intersectional approach to producing and creating public art. In 2017, our “Year of the Woman,” we paid over $37k to nine female artists, over half of whom were women of color, in conceptual design fees and project labor. In 2018, N+T partnered with 21 diverse community partners and invested $120,000 in neighborhoods not always served by public art through Accelerator funding, including Roxbury, East Boston, Jackson/Hyde Square, and Egleston Square. As we gear up for our 2019 season, we’re looking forward to forging even more connections throughout Boston, including a recently-announced partnership with DS4SI for an upcoming artwork project in Upham’s Corner, Dorchester. Perhaps most importantly, working towards equity means listening. To that end, we’re looking forward to our conversation on creating a more equitable climate for public art in Boston at AES19. 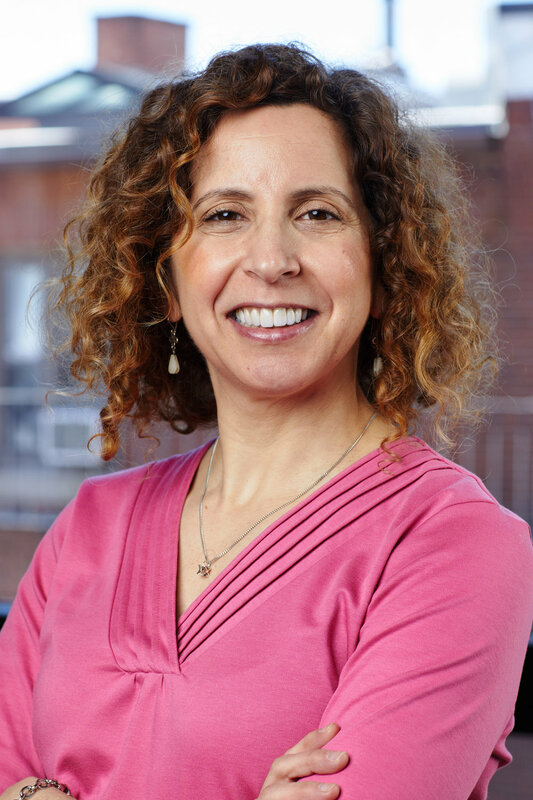 Our Summit panel, “Loop-breaking: creating a virtuous cycle of public art production,” will consider the challenges of creating truly community-oriented artworks and discuss barriers to entry for public art artists and audiences alike. We’re grateful to ACI for making this conference possible, and we look forward to gathering together with friends and partners, new and old. Thanks for having us, AES19! You can learn more about the work N+T is doing by visiting their website. You can also join us as we partner for the Arts Equity Summit by checking out our kick-off event on Friday, March 22nd! Since our first mural in the Bronx in 2011, ARTE has worked extensively with communities throughout New York City, providing quality interactive arts-based activities that educate young people about human rights in schools, community-based organizations, and jails. The first facet of our mission is to educate youth on human rights and equip them with the knowledge to identify the root causes of systemic inequity. Realizing that there was a great disconnect between human rights theory and practice in our students’ day-to-day life, we initially developed to support their communities in realizing and advocating for their inherent human rights. We’ve found that participants become more knowledgeable, interested, and passionate in human rights through the process of public art and particularly in the creation of a public mural. Public murals are a valuable component in our curricula and are designed to empower both students and their local communities to engage in questions surrounding human rights justice and art as a tool for social change--allowing them to reimagine justice actively in their own backyards. ARTE’s first mural focused on the issue of human trafficking. Since then, community members have learned and painted about human rights violations both within the United States and internationally. Some of these issues have included harsh sentencing, poor prison conditions, child slavery, gender inequity, and police brutality. Inspiration has come from women activists and street artists of color. Our artwork is motivated by history and is another reason we prioritize equity in our pedagogy. We’re currently fundraising to publish a redesigned edition of the Universal Declaration of Human Rights. It’s a graphic and contemporary reconception of our founding document, one which feels esoteric and out of reach after 70 years of existence. To reassert its relevance in the lives of our students, we believe releasing the document as an interactive and sleek convertible booklet and poster will bring the text’s mission into the modern day. ARTE strives to offer a platform on which students can freely and safely express themselves and their opinions, all the while providing an arts education their schools and communities often aren’t able to offer. We equip youth with organizing skills that enable them to collectively activate others in steering society towards justice, using their lingua franca and multisensory modes of communication. From comfort with identifying root causes of systemic inequity to feeling empowered to uproot them through the employment of creativity and galvanization of resources and communities, ARTE ultimately equips our students to cultivate equity in their own lives. The tenor and adaptability of our workshops, interdisciplinary curricula, and deep commitment to social justice are why we believe equity is at the basis of our work as a non-profit. You can learn more about the work ARTE is doing by visiting their website. You can also join us as we partner for the Arts Equity Summit by checking out our kick-off event on Friday, March 22nd! Pinkcomma Gallery opened at a time of shifting design sensibilities in Boston. While a significant amount of the city’s work is produced by the largest corporate firms, the gallery aims to foster and recognize a more creative and experimental scene that has grown out of one of the world’s most significant capitals of architectural education. The gallery highlights innovative thinkers of diverse interests. This culture of experimentation and creativity is on the rise, yet continues to need independent venues to encourage its growth. Pinkcomma showcases an emerging generation of talented practitioners, offering them a platform while encouraging broader public support for their innovative sensibility. At the same time, Pinkcomma is a place for the exchange and expansion of ideas within the region’s design scene, not just in terms of architecture, but also in the disciplines of landscape, graphics, urbanism, interiors, and industrial design. The gallery is a neutral ground that brings together thinkers from the six design schools and countless professional practices. The effects have been significant. More than fifty exhibits and gatherings have occurred since opening. Just this year alone, the national Progressive Architecture Awards program includes three firms that had previously exhibited their work in solo shows at Pinkcomma. The gallery’s impact has been recognized by the Boston Society of Architects with the organization’s Commonwealth Award. In short, the gallery performs an important service to the design community: part launching platform, part mixing chamber, it is a place where new design ideas are formed, tested, challenged, and disseminated. You can learn more about the work Pinkcomma is doing by visiting their website. You can also join us as we partner for the Arts Equity Summit by checking out our kick-off event on Friday, March 22nd! Dunamis believes that the lack of comprehensive education is one of the greatest barriers to equity. Therefore, our organization works to provide emerging artists and arts-managers with the tools they need to build successful and long-lasting careers in the arts. Through workshops and individual consultations with our artists, we help them understand their unique identities, provide them with professional development training and support in producing their work. 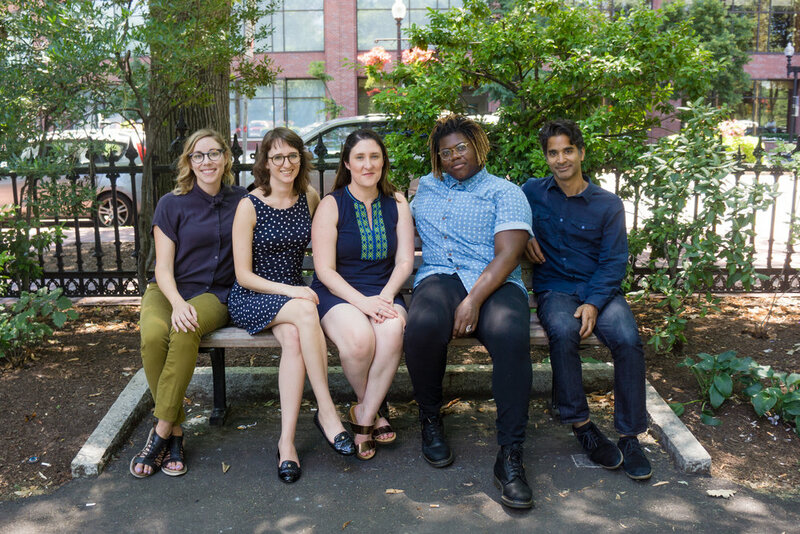 With our Arts Managers we actively work to build a pipeline of diverse arts leaders that challenge the status quo and support work that is reflective of the communities they serve. You can learn more about the work Dunamis is doing by visiting their website. You can also join us as we partner for the Arts Equity Summit by checking out our kick-off event on Friday, March 22nd! 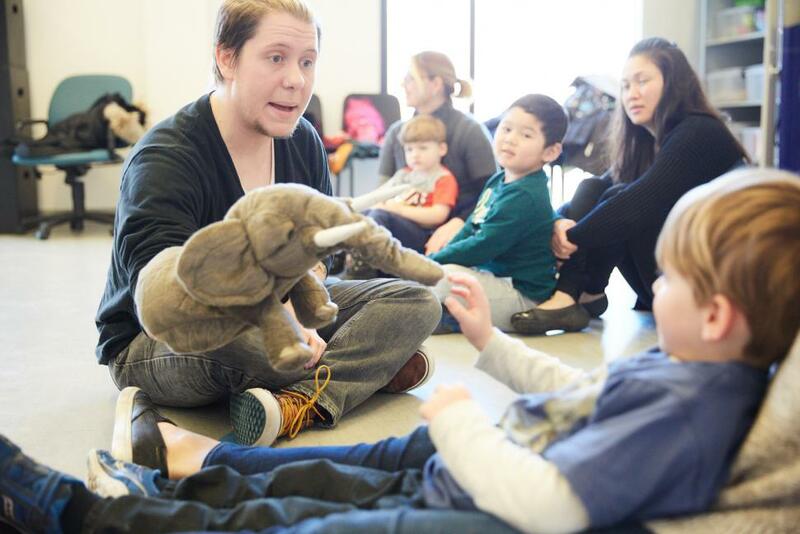 The Berklee Institute for Arts Education and Special Needs (BIAESN)is a catalyst for the inclusion of individuals with special needs in all aspects of performing and visual arts education. Our mission at BIAESN is threefold. First, we provide arts education programs, including private music lessons, music classes, ensembles, two adaptive dance programs, and a theatre program, all specifically for students with disabilities, ages 3 to 93. These programs provide a safe and nurturing environment that meets the individual needs of our students, providing opportunities for them to express themselves through the arts, and challenging them to become the best artists that they can be. Second, we are home to the only Masters in Music Education with a Concentration in Autism graduate program in the world. This program, offered through the Boston Conservatory at Berklee, seeks to prepare the next generation of music educators to work with students with autism and other special needs. Finally, BIAESN provides Professional Development opportunities for arts educators currently in the field who wish to broaden their skill set and provide a more equitable arts education experience for their students with disabilities. Through these three initiatives, BIAESN is changing the landscape for students with disabilities both by providing opportunities right here at Berklee, and by helping to train current and future teachers near and far to provide better arts education opportunities for all their students. You can learn more about the work BIAES is doing by visiting their website. You can also join us as we partner for the Arts Equity Summit by checking out our kick-off event on Friday, March 22nd! HowlRound is a free and open platform for theatremakers worldwide that amplifies progressive, disruptive ideas about the art form and facilitates connection between diverse practitioners. HowlRound’s creation was a direct response to: 1) research that suggested artists were increasingly distant from the center of theatremaking within not-for-profit institutional infrastructure, and 2) the new possibilities created by technology to influence theatre practice. Our founding came at a time when we saw too many voices left off our stages, not represented inside of our institutions, and not recognized for their substantial contribution to our past and present. We set about to create a group of tools that would amplify voices and issues chronically underrepresented and unheard in the theatre. We value generosity and abundance—all are welcome and necessary; community and collaboration over isolation and competition; diverse aesthetics and the evolution of forms of theatre practice; equity, inclusivity, and accessibility for underrepresented theatre communities and practices; and global citizenship—local communities intersecting with global practice. You can learn more about the work HowlRound is doing by visiting their website. You can also join us as we partner for the Arts Equity Summit by checking out our kick-off event on Friday, March 22nd! Brain Arts Organization works to address equity and inclusion by creating platforms for emerging, underrepresented, and independent artists. Since 2009, Brain Arts Organization has been paying artists above all operating and production costs. We believe that artists need support wherever they can find it- even from volunteers who are artists themselves. With the cost of living in the Greater Boston Area always increasing, we believe that it is imperative to support artists actively working in the city. Artists that do not come from wealthy or historically well-supported backgrounds are often at a disadvantage because of these rising living costs. Through our programs, we work to provide opportunities to all working artists, so that the cultural identity of the city and region can reflect its diverse makeup. We also believe that when artists are provided opportunities to develop their practice, they have the ability to meaningfully impact and better their communities. At our community-driven art space in Dorchester, we prioritize providing space either for free or at affordable rates to artists from the Dorchester and surrounding neighborhoods. We meet emerging artists at their level and facilitate and assist them so that they can be empowered to create and inspire their communities. We specifically work to connect artists and other community organizations in order to find opportunities for everyone working within this sphere to further their own goals. Beyond the activities at the art space, our programs and media address the imperative of equity head-on. Since its establishment, our organization has worked to curate a wide audience of patrons who support emerging and underrepresented artists. These artists are prioritized when booking events and always paid for their performances. Our free newspaper, published monthly, provides an access point to the arts for the often forgotten offline demographic, and our website acts as an online alternative to mainstream or social media controlled outlets. Together, these publications serve as a platform to promote the artists featured, as well as a stepping stone for the volunteer staff of writers, administrators, artists, and photographers who run them. Finally, every other month, we host an art market where vendors participate at a low cost and sell their work to the community. Fundamentally, these programs exist to help develop talent and ensure that underrepresented artists continue to develop the cultural identity of the city and region. Our organization has been built organically by volunteers who have the capacity and drive to advocate and produce platforms for the arts in the Greater Boston Area. Our volunteers utilize the free time and privilege they have to work towards the greater goal of arts and community building. These volunteers are able to empower others within their own communities, in contributing to the promotion and production of art and other creative endeavors, and also in considering how these values overlap with civic participation. You can learn more about the work Brain Arts Project is doing by visiting their website. You can also join us as we partner for the Arts Equity Summit by checking out our kick-off event on Friday, March 22nd! Artist-in-residence Chanel Matsunami Govreau discusses Waacking as a practice of radical self love, and midnight dance training in Seoul. Join Arts Connect International & Stephen Hamilton at the launch of his prestigious show, "Black Gods Live", at the Museum of the National Center of Afro-American Artists, Inc., in Roxbury 11/10/15 5-8pm. Artist Leader Hyppolite provides an account of the power of theater in dealing with trauma. He emphasizes that when participating in the arts, one needn't directly talk about a traumatic experience in order to come to terms with it. Artist Leader Andrea Alejandra Gordillo Marquina recounts the stories of Central American migrants as they endure precarious journeys North through México. Artist Leader Chanel Matsunami Govreau details the spread of the dance style "waacking," from its roots in 1970's Los Angeles to modern-day Seoul. ACI Artist Leader, Stephen Hamilton, details the history and evolution of African textiles. ACI Artist Leader, Stephen Hamilton, gives his insight into the Orishas, the powerful spirits of the Yoruba religion. ACI Artist Leader, Stephen Hamilton, reconnects with his authentic self and finds peace through African traditional art forms while on residency in Nigeria. Beyonce's Preferences to African Diaspora in "Lemonade"
ACI Artist Leader, Stephen Hamilton expresses his thoughts on Beyonce's visual album "Lemonade," and the poignant references to Yoruba religion and philosophy encoded within it. Meet our 2016 - 2017 class of Artists-in-Residence, building the global inclusion movement one artist at a time!